Long before delivery and frozen pizzas - you made your own. 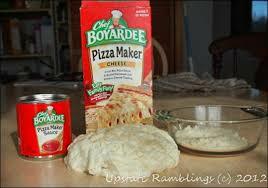 Kit came with flour mix to make your dough, a can of sauce, and cheese. Loved making and eating these! It sure made the house smell like a pizzaria. My dad hated the smell, so whenever my sister in highschool made it, he would leave the house.